We hope you had a wonderful and delicious Thanksgiving! We are only nine days away from our "Spirit of Giving" reading clubs! Make sure to join us as we bring the excitement of the holiday season to our students by reading books about Christmas, Santa and gift-giving. December is one of our biggest months, and the December 13th reading clubs are just over one week away! We can use your help to recruit more volunteers. To get started, sign up with us today. Then join our December 13th Facebook Event so your friends will see that you will be attending. Tweet @readingtokids, post to Facebook, and email your friends, letting them know that we still need more volunteers. Santa is coming, so we expect these reading clubs to be huge! 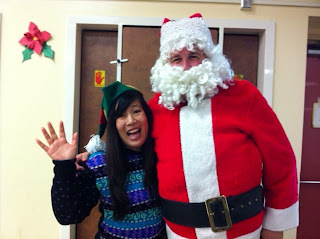 The Santa suits will once again be generously provided by the Pasadena Jaycee's Operation Santa. If you are interested in volunteering for this wonderful project, please click here for more information or email them at OperationSanta@PasadenaJaycees.org! If you're signed up for the Dec. 13th reading clubs but know you can't make it after all, please be sure to cancel your RSVP as soon as you can. Our Annual Fund Drive is in its final month, and we need your help to reach our goal of raising $45,000 this year. So far we have raised $23,251 from 254 donors! Do you wonder what the money you contribute goes toward? •$5 purchases prize books for 4 kids! •$18 purchases 15 take-home prize books for participating kids! •$50 purchases 4 hardcover read aloud books that are donated to school libraries! •$600 purchases a year's worth of prizes books for parents at one school! Make a pledge to donate by check or donate online today by visiting our 2014 Annual Fund Drive page. Contributions of any amount are greatly appreciated! Show your support by asking friends and family to contribute! If every person who is currently signed up for the December 13th reading clubs gathered and brought donations of any size from just 3 people, we could meet our goal! Consider asking coworkers, family, teammates, bowling buddies... you get the picture! We've made it super simple, just print out this donor sheet and start asking, or spend just a few minutes personalizing and sending this sample email! 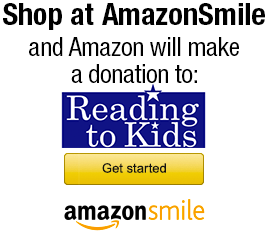 Once they know about Reading to Kids, many will want to donate to us - we just need you to ask! Please show Fluor your enthusiasm for Reading to Kids! Your comment may be featured on the blog, where you can also see inspiring photos from the Nov. 8th reading clubs. We recently received a $10,000 grant from our hometown basketball team, the Los Angeles Clippers! We cannot wait to use the Los Angeles Clippers Foundation's generous donation towards next year's books and are delighted that the Clippers have chosen to support the lives of those in our community. Thank you for your help, and happy recruiting! - 71 More Volunteers Needed for 12/13! - Thank You LA Clippers Foundation!